NEW ORLEANS — Tim Nichols and Amy Regan were at the top of their game this past cross country season and were honored by the U.S. Track & Field and Cross Country Coaches Association (USTFCCCA) on Thursday because of it. 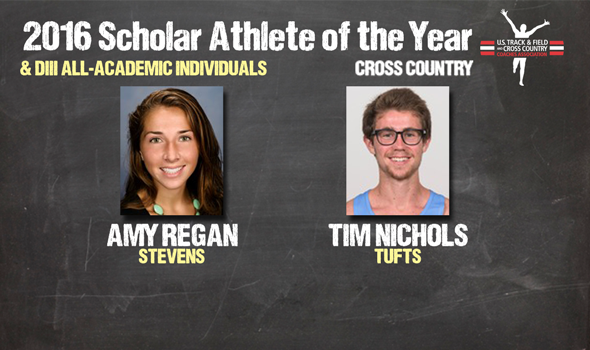 Nichols and Regan were respectively named the NCAA Division III Male and Female Scholar Athletes of the Year for the 2016 cross country season. In total, there were 664 athletes (374 women, 290 men) who earned All-Academic mention from the USTFCCCA in NCAA Division III. In order to be named USTFCCA All-Academic, student-athletes must have a cumulative GPA of 3.30 or higher (on a 4.0 scale) and finish in the top-25 percent at their respective regional. Thirty-one NCAA Division III athletes had perfect 4.0 GPAs with three coming from MIT and two from Dickinson College and UW-La Crosse. Nichols, a senior from North Lima, Ohio maintained a 3.47 GPA in Biology and Anthropology and Colonialism Studies during the 2016 XC season. At the 2016 NCAA Division III Cross Country Championships in Louisville, Kentucky, Nichols finished 3rd as an individual qualifier. Nichols and Widener’s Ernie Pitone finished in a dead heat at the finish line, but Pitone clipped him for 2nd place. A few weeks earlier, Nichols ran away from the pack at the New England Regional and won the individual title going away. Nichols beat the runner-up by 34 seconds. This is the first honor for both Nichols and the Tufts program. Regan returned to the grass after taking the 2015 season off and was no worse for wear. The senior from Green Brook, New Jersey maintained a 3.58 GPA in Engineering Management and went undefeated during the 2016 season. It was at the 2016 NCAA Division III Cross Country Championships where Regan pulled away from the pack at 1K and opened a sizeable lead the rest of the way. Regan won by 15 seconds and captured her 2nd career individual NCAA XC title (2014). The New Jersey native was also the NCAA Division III Women’s Scholar Athlete of the Year in 2014 after she won her 1st NCAA title. See below for a complete list of athletes honored Thursday by the USTFCCCA.